I haven’t received many corporate Christmas gifts in my life. Once when I worked in Subway a colleague did buy me several terrible books from The Works as a part of our team Secret Santa but that’s about the size of it. The books might have been terrible but they came from a good place, she knew I liked reading so she gave me something to read – it’s easy enough to manage that when you’re buying for one person. Actually shopping for a whole army of staff is something more akin to a nightmare though – there is literally no way to bulk buy a gift that will satisfy Bill in accounts who is into medieval war re-enactment and fly fishing as well as Jean in sales who is more interested in real ale and cross fit not to mention Gwilym the vegan on reception. Maybe you’re the truly inspirational kind of leader who will hand select a Christmas gift for each and everyone of your 126 strong team but to be honest I doubt it. Anyone with more than 10 staff at their disposal is likely to go for what they hope is a crowd-pleasing option and that’s where A Gift Card FOR Cardiff can come in – accepted in more than 70 local businesses there’s something to satisfy everyone, you can pop out to Bombers on your lunch break, get a round in after work at The Philharmonic, shop for a vintage wardrobe in Hobos or board games in Rules of Play. Visit the Where to Spend page of our website for the full lowdown on locations. In happy news buying a gift which directly supports local independent businesses is a great way to show off your company’s commitment to the local economy and amongst all the media doom and gloom about the ‘death of the high street’ that’s a sure fire way to win some brownie points. Spending money locally keeps more cash circulating in the Cardiff economy which more often than not is good news for any local business. 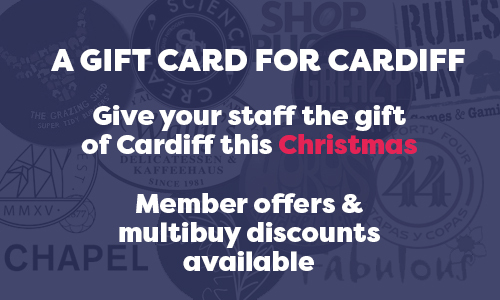 In even happier news bulk buys mean discounts – if you’re buying more than £1,000 worth of gift cards then you’re eligible for a deal and if you’re business is a member of FOR Cardiff then you’re in line for an even better deal. Get in touch via emily@forcardiff.com to find out more.